Houston County Ag and Horticulture News | What’s going on: I’m putting out High-Mag mineral, but cows are still going down?!?! What is grass tetany and why is magnesium important? Grass tetany, also known as grass staggers, magnesium (Mg) tetany, hypomagnesemia, and wheat pasture poisoning, is a nutritional disorder caused by either 1) an inadequate amount of dietary Mg, or, 2) other mineral related factor that is preventing (antagonizing) dietary Mg from being properly absorbed or utilized. Magnesium is considered a macro-mineral and is needed in beef cattle diets to insure proper growth, reproduction, and metabolic function. When dietary Mg is low or utilization is inhibited, neuromuscular function becomes impaired and leads to the clinical symptoms of staggering, muscle twitching, convulsions, and in severe cases, can lead to death. This disorder is most common during cool, cloudy, and rainy weather, and frequently occurs when cool weather is followed by a warm period. Why is magnesium an issue during this time of year? Mg is essential, especially during lactation. 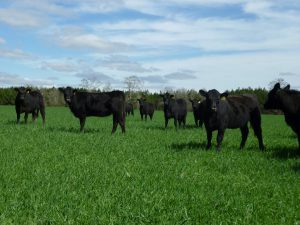 Spring calving cows are highly susceptible to grass tetany because they reach peak lactation (require increased amounts of Mg) during the same time as the spring green. This onset of abundant lush forage is associated with decreased amounts of forage Mg. Older cows are more susceptible because they cannot mobilize Mg from reserves in the bone as quickly as younger cows. High potassium (K) content is also associated with lush, growing forages. Although K is essential, in large amounts, it can work as an antagonist to reduce Mg uptake from the soil and Mg absorption in the rumen. I’m putting out High-Mag mineral, but I am still losing cows? Not consuming enough. There may be a palatability issue, especially when Mg is increased in the mineral. However, cows typically do not voluntarily consume as much mineral this time of year. High-Mg mineral if fed year-round. Sometimes, the strategy is to put high-Mg mineral out all year as an “insurance policy”. Based on the previous point that Mg decreases palatability. High-Mg mineral is only needed during the short period of time that grass tetany may occur. Feeding the miner year-round may condition cattle to not consume enough during the time the really need it. Not enough salt. Magnesium transport across the rumen wall can be reduced if 1) there is not enough salt in the diet, and, 2) if there is too much K in the diet. Collectively, too much K and too little salt can cause grass tetany, even if Mg intake is adequate. Know exactly what cattle are consuming. Do the math based on how much mineral you’re putting out, how many cows, and how fast it is being consumed. Calculate the mineral on an oz/hd/d basis and determine whether or not their consumption meets requirements. Table 1 illustrates calculated consumption based on different feeding rates and herd sizes. Increase intake (if need be) by mixing with feed and/or salt. Again, do the math to ensure the correct intake. OVER CONSUMPTION WILL NOT FIX THE PROBLEM. Add salt. In addition to increasing the mineral intake, additional salt will ensure that the sodium requirement is being met and thus, help to maximize absorption of Mg. DO NOT DO THIS IN PLACE OF HIGH MAG, rather in addition to. This can be as simple as putting out plain white salt blocks.